Sacred cows covered in paint? The world's brightest festival initiates an iffy outsider into an ancient Indian tradition. During the festival of Holi, hundreds of millions of people across India and Nepal fling colored powders and liquids at one another in one of the world’s brightest—and sloppiest—public rituals. A few years ago, I booked a trip to India and discovered after the fact that my flight was scheduled to land in Bangalore a little after midnight on Holi, which takes place each year in late February or early March. Would the airport be a pandemonium of jetlagged passengers with stained faces, clothes, and luggage, I wondered. Would I need to defend myself against tie-dyed militias canvassing the terminal with red, green, blue, yellow, and pink balls of colored powder? I braced myself as I stepped off the plane, but to my relief there were no attackers in sight. The airport terminal was chaotic but normal, as were the streets of Bangalore en route to my guesthouse. Jet lag kept me sleeping most of the next morning, but after lunch, I ventured from my room into town. The residue of Holi was everywhere. Multicolored splotches pocked the ground. A friendly stray dog sat panting, his white flank streaked with red. Very little had been spared. Even the ever-present sacred cow sported a brand of blue on his back. Around a corner, a group of university students wearing splattered clothes and showing off rainbow-colored faces traded war stories. As I walked past them, I wondered if I, the sole foreigner on the road, would become a dumping ground for their leftover ammunition. I tried my best not to make eye contact yet a part of me wanted to incite them, to holler “Bet you can’t catch me!” and hurry off at a trot. Perhaps getting attacked with colored powder would be the initiation into India I had been pining for. The moment passed. When I returned to my room, I took off my shoes. The only out-of-place color on me was the red from where my new Chacos had rubbed my feet raw. I wasn’t sure whether to feel triumphant or defeated. The festival of Holi goes back to a number of stories in Hindu mythology. The most famous account involves a maniacal demon king whose desperation for the world’s worship leads him to hatch a plan against his son when the boy gives his praise to a different god. Enraged, the king commands his daughter, a girl who is blessed with supernatural power to withstand flames, to ferry her brother into a huge blaze. Unbeknownst to her father, the girl’s powers carry fine print: She can only survive fire if she is alone inside of it. So when she obeys her father, she perishes in the flames. Meanwhile, her brother’s god miraculously saves him from an ashy death. Holi, on a cosmic level, celebrates this story, a victory of good over evil, the handy defeat of duplicitous relations and pride. Where the business about the colored powders comes from is trickier to pin down. Legend has it that the Hindu god Krishna soaked his female consorts with colored powders and liquids during a Holi celebration in the woods. A centuries-old sculpture in the ancient ruins of a former capital of India depicts maidens about to shoot colored liquids at their master and mistress. Ancient sources allude to the tradition of throwing powders, paints and colored liquids, but like many other things in South Asia, none of these sources shed light on the reason for the ritual. Whatever the case, modern-day Holi is a festival that lauds color, a holiday when enemies set aside differences, when members of different castes interact, when men and women, so often separated in this conservative society, mingle. Even non-Hindus join in the fun. The festival is also an economic watershed for many communities. Days before Holi, markets fill with colored powders and shoppers build up their armory to store at home until the big celebration. A year after my near-encounter with Holi in Bangalore, I found myself in Kathmandu, Nepal, the day before the festival. 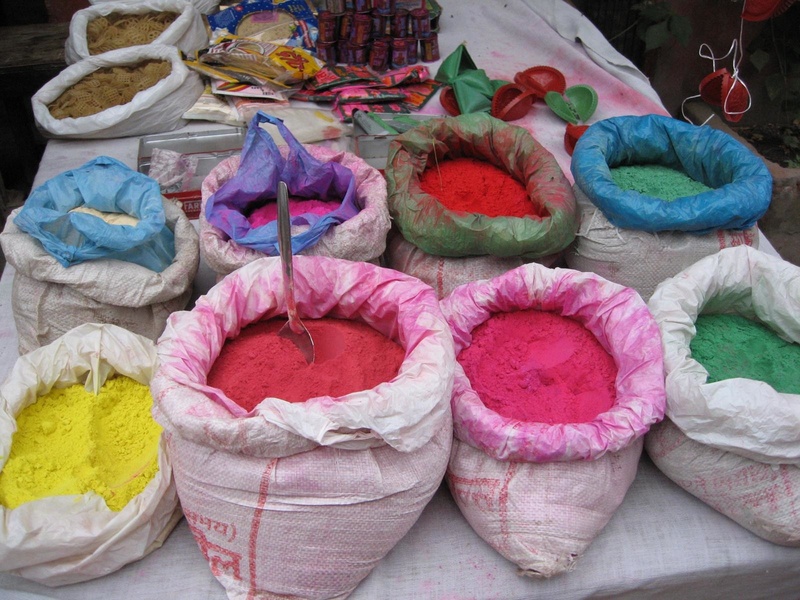 Nepalis have a reputation of being more militant during Holi time: They mix their colored powders with lots of water. As I cautiously traipsed through the crowded backpacker area of Thamel, I heard a splash about three feet away. From two floors above, a plastic bag of water tumbled down. I leapt out of the way at the last moment, dry except for my shoes. Having nearly escaped disaster, I stepped up my pace and made plans to lay low in my hotel the next day. My prior desire to join in the festivities had been replaced with a firm resolve to let them pass me by. After all, I was beginning a month-long journey across South Asia with a small wardrobe. I could not afford to have my shirts and jeans transformed into tie-dye. The next day, however, when I heard a crowd of hundreds celebrating Holi in a nearby field, I felt the tug again. Should I dive in and let myself get pounded? Expats I encountered on my trip gave me the skinny. According to them, most of the action on Holi happens in the morning and peters out around lunch, which gives celebrants time to get cleaned up before visiting family and friends in the evening. Most of my informants, dressed in old clothes, were prepared to get messy, but one woman wore a simple, pure white shalwar kameez (baggy trousers with a long blouse) in hopes of making the colors stand out even more. She said she also put coconut oil on her skin and in her hair, which helps the powders and colors wash off easily. She said one of her friend’s who had neglected this precaution had a maroon tinge to her skin and hair for weeks afterward. I heard other stories about people getting hit with ice water, powders and liquids that sting, and even acid. After weighing these anecdotes in the balance, I demurred again and opted to spend my second Holi responding to emails and taking a long bath. As fate would have it, I found myself back in India on Holi this past March. In the days leading up to the holiday, I went with some friends to a resort in Corbett National Park, a tiger reserve northeast of Delhi. Truth be told, I spent most of the last night on the toilet wondering whether my stomach sickness came from the moldy room, something I ate or drank, or both. The next day, we had train tickets back to Delhi, but a strike led to cancellation of all trains in our area. The solution was a 10-hour bus ride. I doped myself up with Ciplox and Imodium and prayed the bus wouldn’t be too crowded. Enough guests needed to get to Delhi for the resort to charter an air-conditioned bus. I was able to secure a seat and did my best to sleep as we puttered through village after village and dodged rickshaws, motorcycles, and oxcarts, negotiating curves and bridges along the way. Holi, however, added a wild card to the landscape. Groups of color-covered young men blockaded the roads of each nondescript town with long pieces of rope and demanded money in exchange for passage. Then, one after another, they doused the vehicles, drivers, and passengers with buckets of colored water and powders. Our bus driver managed to break through some barriers without pay. Occasionally, he tossed some rupees to the celebrants in return for safe passage. Protected by windows, the foreigners on my bus snapped pictures of our temporary captors. I gathered enough strength to look out of my window, thankful for the shield between my face and the crowd. Then a huge bucket of pink water sloshed against the window. I immediately felt something wet. The shoulder of my dark blue t-shirt was now purple, the liquid dripping down onto my right arm, leaving a pink tattoo. My cargo pants were splotched pink, and so was my camera. Even my bag of fruit was soaked. My window was slightly cracked open. “Are you all right?” said a concerned passenger who knew I was sick. I was feeling sicker than ever, but I couldn’t help smiling. Against my best efforts, I had finally been initiated into Holi. Yes, I was alone in a foreign country, but with one bucket of pink water I had become united with millions of people. In the Hindi language, things happen to the person speaking. Instead of saying “I got angry,” the speaker says, “Anger happened to me.” I had not gone searching for Holi. Holi happened to me. But let it be known: Next time, I plan on throwing something back.